Some of you may remember my review of the novel a while back (if you haven’t read it, click here), which got a very favorable review for being a history of the political, military, economic, social, educational, religious, ethical, and moral ramifications of a zombie war as told through a series of vignettes from witnesses of the war (try saying that three time fast). After reading the book, set ten years after the end of the war, my whole family–or just me and my mother, plus my sister who hasn’t read the book–wondered how the movie would differ from the book. Obviously there would be a lot of differences, seeing as the movie shows the zombie war as it begins. When we got to the theatre yesterday, had our coupon denied, sat through a hundred corporate ads, had the projector break down, and finally started the movie, we hoped that even with so many liberties, the movie would be good. We weren’t disappointed. 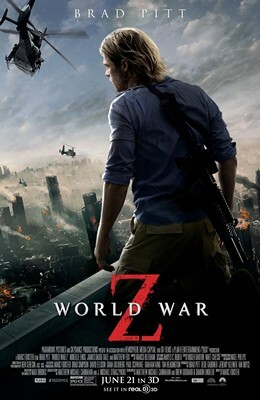 Although plenty of liberties were taken and plenty of stuff was left out–the zombies were fast-moving rather than slow shufflers, there was no mention of the new religious empire of Russia or the South Africa plan, changes in what happens to North Korea, and a huge difference in what happens to Israel–the movie was a decent zombie thriller. Brad Pitt was awesome as Gerry Lane, a retired UN worker who’s called back into service when the plague breaks out. He is surrounded by a great cast and zombies who are so lifelike–or maybe un-lifelike is better–that whether they are CGI or actors in make-up, they look so real. The movie zigzags around the world, from Philedelphia to the Atlantic Ocean to Korea to Israel (whoop-whoop!) to Wales and finally to Nova Scotia, but there are plenty of thrills and tense situations in-between that have you on the edge of your seat. And finally there’s the scene in the vault in Wales, where the final twist in the movie is revealed. At the end, you’ll be enjoying yourself despite all the liberties taken. My family and I left the theater discussing the movie and its many differences from the book, but how we enjoyed it all the same. I’m going to give the film a 4.4 out of 5, for being the first decent zombie film I’ve seen in a while. Oh, and apparently Paramount is moving ahead with plans for a sequel, despite the fact that the original was plagued with numerous problems and production costs skyrocketed. Not surprising, considering horror has had a history of doing sequels long after the sequels should stop, and this was well before the sequel mania we are in began. I’m not sure if I’ll see the sequel, but considering that it took six years for the movie to actually make it to the screen, I tink enough time will pass for me to actually enjoy the sequel.